Kawaii cats Neko Yoko and Mia enjoy having lovely time together. Each month is different and is full of awesome things. Travelling, flowers, tea time, and much-much more to enjoy together! The unique cute cat-themed calendar with each month page featuring gorgeous Neko and Mia spending time together. Neko Calendar has a special story of its creation. Read it here. Super adorable cat-themed scenes from the life of cat Neko Yoko and Mia! The Neko Calendar contains 12 printable pages for 12 months, plus 3 additional pages. All pages are undated, so you can use any page for the current or upcoming month! You will receive one DIGITAL ready-to-print PDF file with all the pages. Print all pages. Choose any page with Neko and Mia for the current month. Add dates and important events (you will never forget the friends’ birthdays!). Put the Neko Calendar on the wall. You can put the whole calendar at once or just one page (punch a hole or use Bostik Blu-Tack, Magic Sticky Tape, or 3M COMMAND Hanging Tabs). Print all pages on an A4-sized thick paper (300-350gsmm, e.g. Color Copy A4 Paper 300gsm). In the printer settings, set the “Scale” option to 100% or Fit, so the calendar drawing occupies the most of the page space. For the best result, set the page border (margins or white space) to zero. 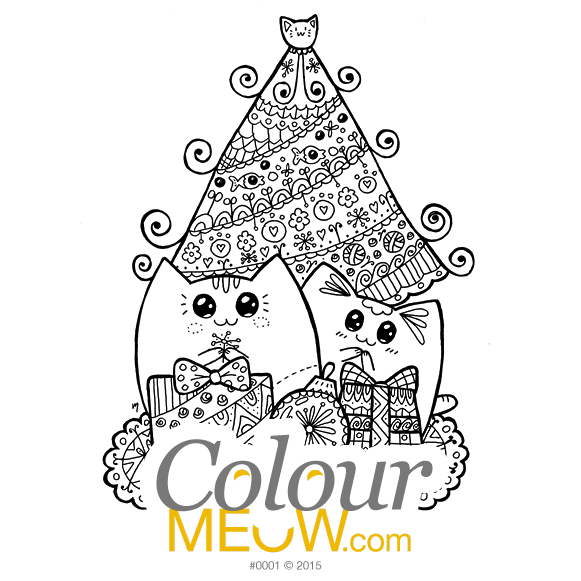 Cute Printable Cat Colouring Calendar-Planner - Neko Yoko & Mia - Series 1 - Lots Of Cuteness. Kawaii cats Neko Yoko and Mia enjoy having lovely time together. Each month is different and is full of awesome things. Travelling, flowers, tea time, and much-much more to enjoy together! The unique cute cat-themed calendar with each month page featuring gorgeous Neko and Mia spending time together. The Neko Calendar contains 12 printable pages for months, plus 3 additional pages. All pages are undated, so you can use any page for the current or upcoming month! You will receive one DIGITAL ready-to-print PDF file with all the pages. How to use the Neko Calendar-Planner: Print all pages. Choose any page with Neko and Mia for the current month. Add dates and important events (you will never forget the friends' birthdays!). Put the Neko Calendar on the wall. You can put the whole calendar at once or just one page. How to print the Neko Calendar-Planner: Print all pages on an A4-sized thick paper (300-350gsm). In the printer settings, set the "Scale" option to 100% or Fit, so the calendar drawing occupies the most of the page space. For the best result, set the page border (margins or white space) to zero. I dedicate this calendar to my special needs cat Kitty. As a celebration of his life. I write these words while my three-legged teethless cat Kitty (official name Megee) is still alive. Several weeks ago he developed a life-threatening anaemia. Two blood transfusions later, we found that he has an incurable bone marrow disease. His bone marrow stopped producing red blood cells. This means no oxygen carries through his body and his blood becomes water-like. Thanks to the donor cats’ blood, he’s alive today. I slept on the floor to comfort him, saying how I love him, and have done many other things to do my best for him. Before this, I lost my day job due to redundancy. Also four years ago, almost exactly on the same day when Kitty got sick, I lost another cat, my precious Manya, who inspired me for Ozzi Cat Magazine. I started drawing Neko, a cat character that I invented, as his smiley face and shiny eyes made me feel better. One day, only one calendar page left to be drawn. I was afraid to finish it, as at that time we still had a hope that Kitty’s disease type was curable, and I felt like his life would finish if I drew that last page. I kept hoping for a miracle even when we found out that the disease was incurable. Since the diagnosis, Kitty and me were living one day at a time. None of us knew what would happen tomorrow, we only had today. I suddenly felt and realised that the last page of this calendar would be a celebration of the Kitty’s life. That put my heart at ease and filled it with warmth. I finished the calendar, putting additional love and light into that last page. I didn’t know what tomorrow would bring, I only had today. I hope that Neko will help you overcome rainy days and will put a smile on your face. Neko will be your best true friend, when you need him most. We don’t know what tomorrow will bring, but we have today. Kitty became a bright shiny star in the sky on October 24, 2015. Kitty will live in my heart forever. Neko Yoko is in a garden. He is excited to be among beautiful flowers. Soft wind gently touches the flowers’ tops. So calm and relaxing. Neko feels happy. Who will he share the happiness with? 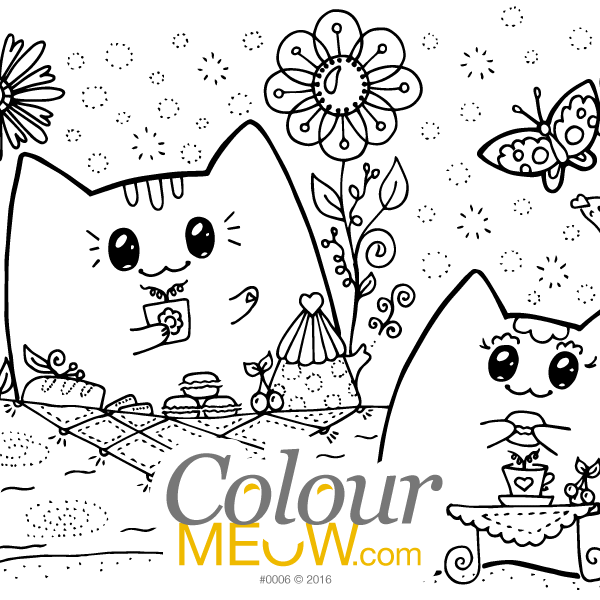 Join the Colour Meow cat colouring club to find out! Colour this adorable cat picture. Send it to someone to show love, appreciation, as a Thank You note coming from the heart, and to uplift their spirit. 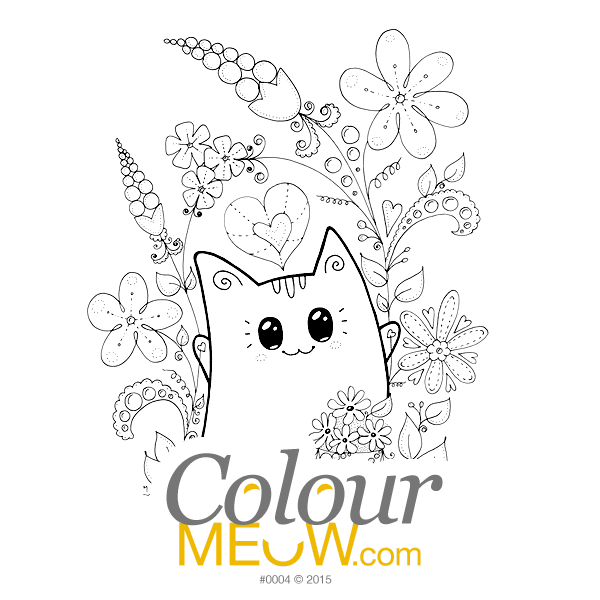 This colouring cat is great as a gentle drop of happiness into someone’s life! A cute cat Neko with a heart letter is holding a flower and smiling. What is inside the letter? It must be something exciting! Colour this adorable cat picture. Send it to someone to show love, appreciation, as a Thank You note coming from the heart. 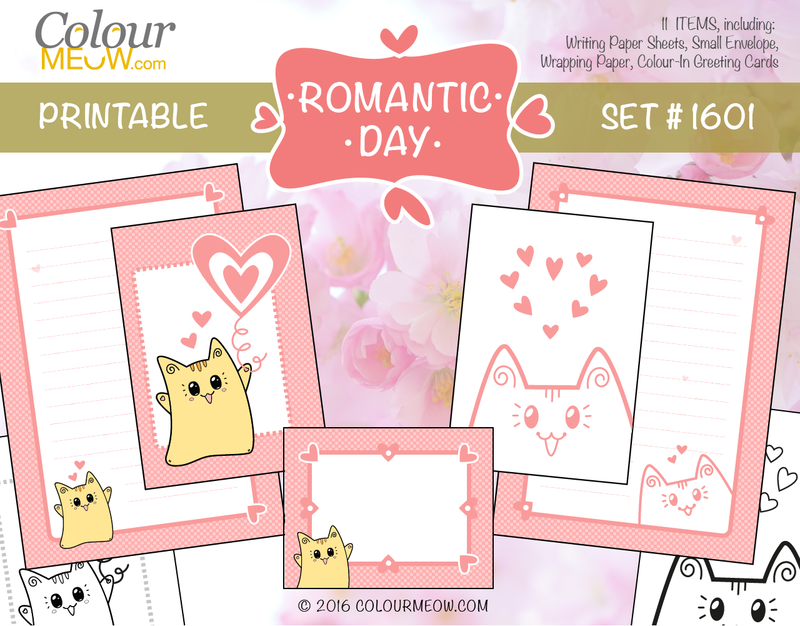 This colouring cat is great as a cute Valentine cat card!